Porcelain veneers are made from a ceramic material that is bonded to the front of teeth to change the tooth's color, size, and/or shape. These must be made outside of the mouth and they require more than one visit. 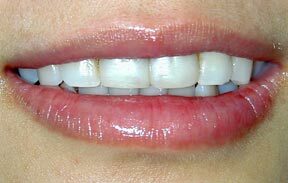 The natural results we can achieve with porcelain veneers are incredible. 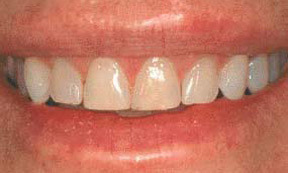 Please look though our Veneers Gallery to see some examples of the type of dentistry that we provide for our patients. This patient was not happy with many things. One of her front teeth was discolored, and she did not like the spaces or the length of her teeth. 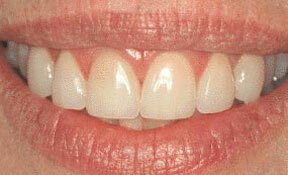 This is the result of her treatment after the placement of eight porcelain veneers. The color is very natural, the spaces have been closed, and the teeth have been lengthened. The main complaint this patient had was spacing, but he also wanted his chipped teeth fixed as part of the treatment plan. 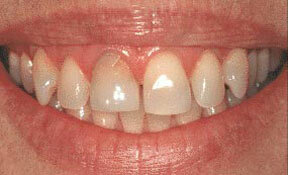 This is the result after the placement of six porcelain veneers, which made the patient very happy. The spaces have all disappeared and his teeth look very natural, giving him a tremendous confidence boost. This patient had her front teeth bonded several years ago and the bonding was beginning to show its age by having lost some of its luster. 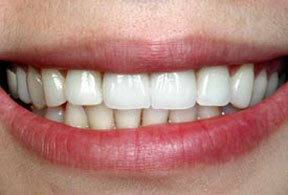 The treatment was to remove the old bonding and replace them with porcelain veneers. The result is a very natural, life-like appearance and the patient was very happy! 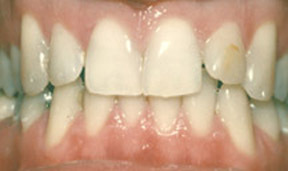 This patient did not like the color, shape, or spacing of her teeth. She was very self conscious of her smile. 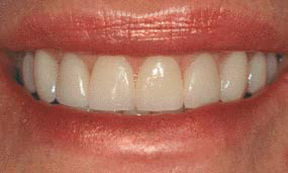 After placement of six porcelain veneers, all of the patient's goals were met and she was very happy with the result. This patient broke his tooth when he accidentally bit into a fork while eating. A porcelain veneer was placed and the result appears as if the tooth was never broken! 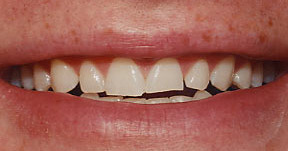 This patient was not happy with the different lengths of her two front teeth, the basic shape of all of her front teeth, as well as the color. Five porcelain veneers were placed and the patient was very happy with the results. 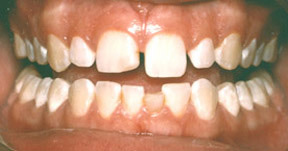 The canine tooth in the upper left of the photo was an existing crown, which is why five veneers were placed instead of six. 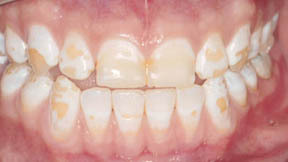 This patient has what we called "mottled" enamel, which can be caused by too much fluoride when the teeth are being formed. 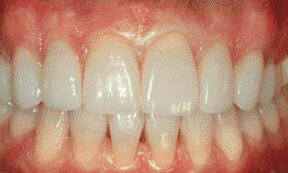 Treatment consisted of placing ten porcelain veneers on the upper teeth, which resulted in a very natural appearance. Treatment required two appointments, a few days apart. 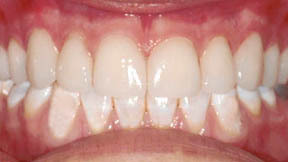 The lower teeth were treated with composite bonding due to the patient's financial constraints. This patient was unhappy with several things. 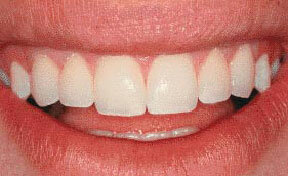 First, she did not like the space between her teeth and was dissatisfied with the uneven lengths and the alignment. 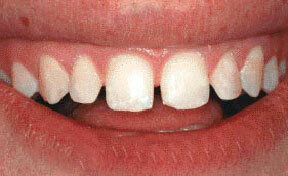 If you look carefully at the bottom teeth, you will notice that one tooth is much smaller than the others. This is a retained baby tooth - the adult tooth that should have taken its place never appeared. 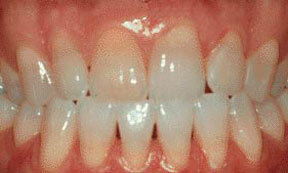 Six porcelain veneers were placed and composite bonding was placed on the retained baby tooth. 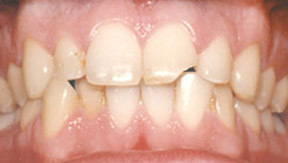 The result of the treatment gave the patient much more confidence in her smile. This patient was unhappy with the different colors of her two front teeth. Her left central, the center tooth on your right, was darkened due to a trauma she suffered about 10 years prior to the photo. She also felt that her teeth were too sharp and too short. 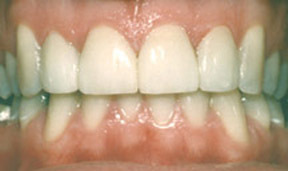 Six porcelain veneers were placed that resolved all of the patient's concerns. The teeth were lengthened so that they are a consistent color and length. This patient was unhappy with the way the laterals (the smaller teeth next to the two center teeth) stuck out. He also felt that his two center teeth, or centrals, were too long and gave him a Bugs Bunny look. Part of this was due to the laterals not being in the correct position. 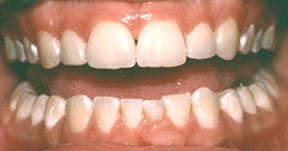 The treatment consistent of placing four porcelain veneers on the front four teeth. We added some width to the two front teeth and brought the laterals into alignment. 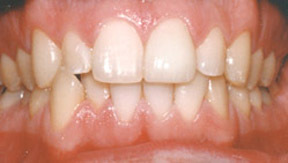 This is a case of instant orthodontics since it took less than two weeks from start to finish. 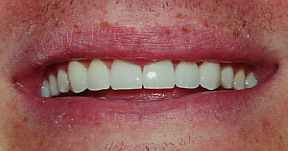 This patient did not like the size and the uneven appearance of his teeth. The unevenness was due to bruxism. The treatment consisted of placing six porcelain veneers on the front six teeth and making a nightguard to not only protect the veneers, but his natural teeth as well. This patient did not like the color, the shape, or the length of his teeth. 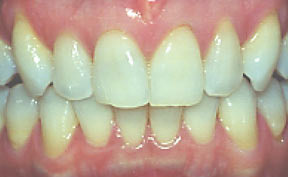 If length was not an issue, one option would have been to whiten the teeth, followed by orthodontics. 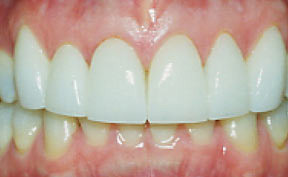 Since that would not address the length issue, the treatment of choice was porcelain veneers. Six porcelain veneers were placed and all the goals of treatment were met. The patient was very happy with the color, shape, and length.